When you also grow your own seedlings, it's a lot cheaper than purchasing them; not to mention that satisfying, gratifying feeling. And somehow it really gets you in the mood to get the garden underway, especially in those brr...cooler climates. First read these Sowing guides, for information on growing vegetable seedlings based on your climate and hemisphere. Back time the date you hope you'll be frost free and start your vegetable seedlings about 6-8 weeks earlier. 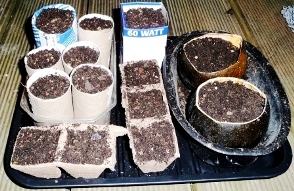 Of course, you will have to start them off under cover or indoors, so this will guide you, Starting seedlings indoors. Vegetable seeds need a light, friable soil that will hold moisture to grow. The soil should not be too light and sandy so that it dries out quickly, but not too heavy so that it compacts and clogs up the air spaces. Seeds must absorb 40-60% of their weight in water to trigger germination. They also need air. When they sprout, they take up moisture from the film of water around the soil particles and they take up air from the space between those particles. So soil quality is important. Individual pots that disintegrate are a good idea. The seeds are planted straight into the pots and once they are big enough the whole thing goes into the ground without disturbing the roots of your baby plants. Peat pots used to be popular, but being from a non-renewable source and the problem of the world's peat bogs being drained, it makes sense to use an alternative, such as plant fibre, palm or coconut coir pots. Even better than spending money buying seed pots, what you can find at home? Loo rolls, other cardboard containers, handmade newspaper pots; and of course any and all of the plastic food containers lying around. You CAN sow your seeds straight into the garden of course, even a no dig garden. Just make sure that the soil and layers have settled down nicely and the decay process won't give little seeds a rocky ride. When sowing straight into your no dig garden, make a depression or form a shallow ditch, then fill with fine soil, sow seeds and cover with more soil. Don't put mulch over these areas yet. Whether in pots or the garden, seeds should be sown approximately at a depth of twice times their size. So a pumpkin seed would go in roughly at 2cms (¾ inch). Small seeds just need a light sprinkling of fine soil. Onions and most root crops, particularly carrots are best sown directly into the garden as they suffer if their roots are disturbed. There again, carrots, parsnips and suchlike will struggle in new no dig beds because it's like an obstacle race for them and they will grow distorted. Either dig a deep trench and fill with fine soil for sowing carrots and like-minded sorts, or grow small or stumpy carrot varieties. Other seeds that are easy to sow direct in the garden are the biggies where you can just pop a handful of soil in a hole, place the bean, pea, pumpkin etc seed in and cover over. Warmth is most important for germinating seeds. Most garden seeds will germinate if soil temperature is around 20C (68F). For colder climates seed beds must be kept warm either by having them in a sunny protected spot in or near the house (like a porch or garage, out of the elements) or in a glass or plastic covered cold frame. Some seeds germinate faster than others. You should have some idea when to expect your seeds to sprout to gauge your success. For planning purposes, here's a germination guide for popular vegetables. For most vegetable seeds you can expect a germination time of 6-20 days. In another 4-5 weeks, those seedlings should be transplanted into your no dig garden bed. Good vegetable gardeners learn from trial and error; and better gardeners write it down in a ruled notebook and fill up the columns with a sow-by-sow account. Come each season they ferret though their previous plant records to see — clear as mud — what and when they sowed and hopefully what worked for them. And these days the best gardeners take advantage of other people's comprehensive expertise, combined with technology, and use the latest and laziest way and use GrowVeg Seed Sowing and Planting Garden Planner. 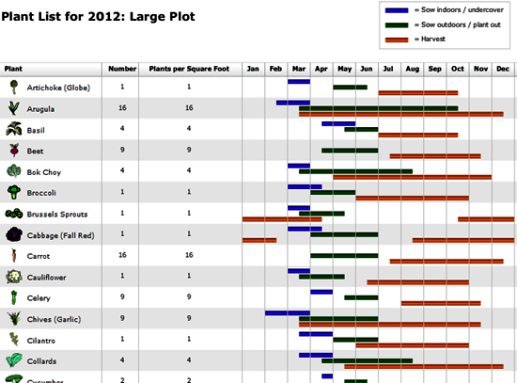 Like me, as one of the best gardeners lucky enough to have GrowVeg Planner, you'll pat yourself on the back as you glance at your propagation records and see exactly the dates seeds were sown; when they germinated; the success rate; time when ready for transplanting... and finally when you sat down to eat your carrot and swede mash! Perfect. Even better you can discover new vegetables to grow with GrowVeg. Simply follow the charts for your area and you can easily see the right time for sowing and growing new vegetables you think you might enjoy, as well as your old favorites of course. The quality and variety of the seeds you use will also have an impact on your success. For more information on heirloom seeds, hybrid seeds and how to choose the best vegetable seeds for your circumstances, see seed products. Seeds must be kept moist but not wet until the seedlings emerge. This may take between 1-3 weeks, depending on the plant type. As they grow stronger, thorough but less frequent watering is required to encourage root growth. They will need shade when young but should be increasingly exposed to the sun so they become used to conditions in the garden. Water in the morning rather than at night. Aim to build your no dig garden at least one week before you are ready to transplant. That will give it time to settle. Mark where you plan to put each of your plants. Use a trowel to make a hole large enough to take the root system. Have the soil in the seedlings' containers damp enough so that the soil clings to the roots of each plant as much as possible. Gently prise or tip out each vegetable seedling from its container taking as much of the soil as you can with it into the garden bed. 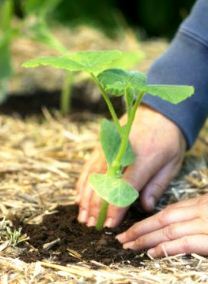 Firm the soil around the plant in its new position, cover the area with mulch and water in gently. Initially leave a small gap between the mulch and seedlings so that rot does not set in when the plants are so young and tender. It is best to transplant seedlings in the late afternoon or evening to give the plants time to settle before being subjected to midday sun.